@jspepper Typing too fast! Fixed. @mattprd Can you tell us some of the most successful bots using Octane that has enabled you to put together the strategy of growing an audience on Messenger? Also, I did something similar with some bots I made using Chatfuel and just using Quick-Replies to spur the continued conversation or even using the gallery card without images works quite well for pre-determined prompts for a user to use. So my question would be what are the benefits of using Convos versus what I (and people like @joshbocanegra ) have done using Chatfuel previously? Are these more 'conversation templates' that you can just easily edit, rather than creating the whole flow from scratch? @bentossell @mattprd @joshbocanegra To answer your questions: 1) The first to use Convos was Maroon 5. They shared Convos with their audience about their recent tour and exclusive photos, and those convos drove tens of thousands of people to the Maroon 5 bot. 24 hours before the release of their new single #COLD, they shared an exclusive preview of the song. That convo went viral and in 24 hours, THE SIZE OF THEIR BOT'S AUDIENCE DOUBLED. Today, Maroon 5's bot is approaching the same engagement rates as its Facebook Page with a fraction of the audience. 2) Try out the Convos editor. It is just like writing a blog post on Medium. That's the big thing here -- you don't have to hard code content anymore. We made it super, super, super, super easy to make LOTS of content and share that content. It's made for content creators, bloggers, social media managers -- everyone who isn't technical. If you want a bot with the most customization and features, that's not Octane AI. If you want a bot that is super easy to manage and grow through content, use Octane AI. 3) We don't do templates. 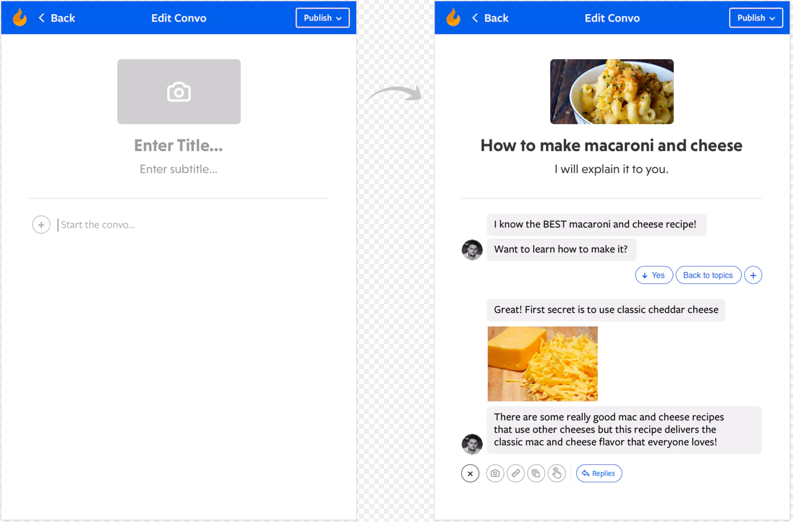 Try out the Convos editor. No need for templates. We simply want people to experiment with content and share it! @bentossell We will be publishing a case study for Maroon 5 in the next few days. @benparr 1. Nice - look forward to seeing the case study. Do you have some case studies on going from bot-audience zero so growing an audience? I imagine its a lot easier when you have millions of fans to help promote to already 😉 2 + 3. Ahh ok gotcha. Would be good to show a screenshot of the Convos editor here so people (incl me) can see. As I've created conversations with prompts before but yeah I did it in a roundabout way. The idea of a medium like editor sounds good but some images here would be awesome. EDIT: I found images of the editor, but it was hidden away in the gallery ha. @bentossell I couldn't re-order the images without deleting some in PH! With more people on messaging platforms than social networks, bots are a huge opportunity and not just for creating amazing AI. We think bots present a great creative platform to write interactive stories and have amazing experiences with users. If you're looking to start a blog in 2017, we would like you to consider starting a bot instead. The core of the product we've released is around Convos, which is all about telling shareable, interactive stories. We've been really heads down on this for the past few months and are very excited to have it out in the wild and look forward to getting everyone's feedback. @meganberry interesting idea - do you view this both as a distribution channel (transform my blog into short-form teaser through individual messenger posts) and a stand-alone (author here instead of elsewhere)? What do you propose as a method to measure unique engagement/interaction, and are you able to embed scripts like Google Analytics to measure this independently? @grmeyer Greg, I think either is interesting, but I'm partial to seeing what will happen to people who try doing it stand-alone. I think thinking "Messenger-first" might be super interesting. Re analytics, we track some stats right now, including views of each of your Convos (i.e. posts), Read rate of Convos (i.e. percentage of people who get to the end of a given convo), total users, total subscribers, and messages sent to your bot. Would love you to check it out and see what you think! In terms on an independent tracker, that hasn't been a big request for us yet from our private beta partners since we do have pretty good stats, but I could see us making it easy to integrate with out bot stats platforms if that becomes important to our users. @MattPRD Does this follow a Medium-style story telling format where the user always starts from the beginning of a story and can get updates as the story progresses, or does it follow a format similar to Quartz's app, where the user starts from the most recent entry (news style storytelling) ? @joshbarkin Hey Josh! You create multiple convos the same way you would create multiple blog posts. So similar to what Quartz does, but you can tell the entire story via the bot (no need to link off to a full article if you don't want to). What I find really cool about convos, is it's pretty open ended. There are a lot of conversational experiences you could create using them (stories, recipes, jokes, FAQs, etc). Excited to begin testing it out. When in Chrome and trying to add multiple images the popup window doesn't allow to scroll so I can't save the work being done. I love that it keeps records of questions the bot can't answer. Many platforms are missing this.